Fig trees (Ficus carica L) originally were found in Western Africa and later were distributed throughout the Mediterranean. Figs thrive in dry, warm climates. Excessive rain and moisture during the development and ripening of the fruit may cause the fig to split. Fig trees will grow in cool, damp areas with a little extra attention. To successfully grow figs, choose a variety that best suits your climate. A member of the common category of figs, the celeste is a cold-hardy fig tree that often is found in the southeastern parts of the United States. The tree is large, usually reaching heights between 10 to 30 feet. The bright green leaves are slightly hairy on both sides. The foliage has a tropical-feeling during the summer months. 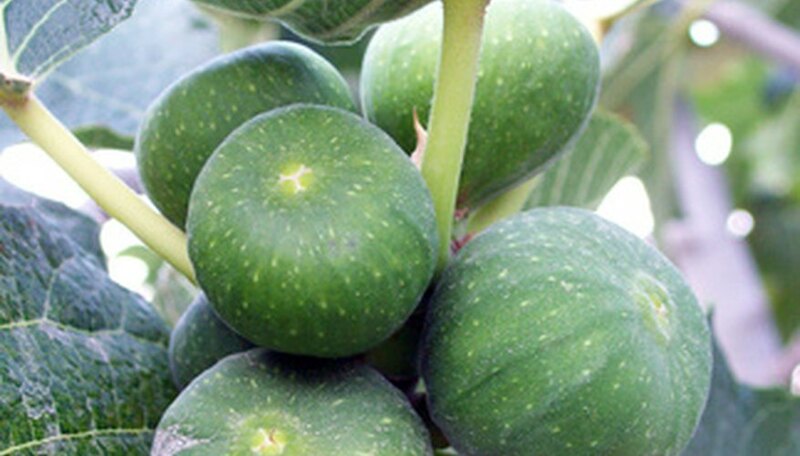 Plant celeste fig trees in full sun and in sandy, rich loam that is well-drained. Young fig trees require regular watering, but once established they become highly drought tolerant. The celeste produces a small- to medium-sized fig in mid-June that is brown to purple in color and has a nearly seedless, amber pulp. Celeste figs have a sweet, caramel-like flavor and are good to eat fresh or for canning. Grown inland or along coastal areas of California, Chile and Italy, the Kadota fig tree is low maintenance and provides dense shade. Trees reach heights of 15 feet and can expand to be 20 feet wide. Leaves are dark green in color and figs are medium-sized, tough-skinned and yellow green if planted inland. They are green if grown along the coast. Trees require full to partial sun exposure and thrive in sandy soil mixed with clay. Kadota fig trees need regular watering and have a high tolerance for heat and humidity. The Kadota fig has a seedy, amber pulp, a full rich, honey-like flavor and resist souring, which makes it excellent for drying and canning. Kadota figs often ripen in June and again in August. Considered a high-quality fig tree, the alma was bred at Texas A&M University and has adapted well to the southeast. Alma trees have dark green foliage and require full to partial sun. Trees thrive in well-drained, sandy, moist, loam soils but are highly tolerant of poor soil conditions. Water alma fig trees deeply twice a month during the summer. The alma is an extremely productive tree and produces figs that ripen in late June and again in August. Alma figs are a cross between the female Allison fig and the male Hamma Caprifig. The fruit is small to medium in size, has a pear shape, golden-brown skin and an amber pulp. Alma figs are sweet, delicate caramel flavored figs and are best served fresh, dried and as preserves. Found in areas of the southwest and drier areas of the South, the brunswick fig tree is fairly hardy. Trees range from 10 to 15 feet in height and have medium to dark green foliage. Plant your brunswick fig trees in full sun and in rich, sandy loam soil that is kept dry to slightly moist. Water them regularly when young. Once established, a deep-watering is required twice a month. Brunswick fig trees produce ripened figs in June and in August. The fruit will be ruined if it is exposed to excessive rain. The brunswick fig is medium to large in size and has a bronze-yellow or purple brown skin. The fig is nearly seedless, pulp is amber in color and has a rich, sweet flavor. Brunswick figs are best when served fresh or dried. What Fruit Trees Grow in Victoria, B.C. ?